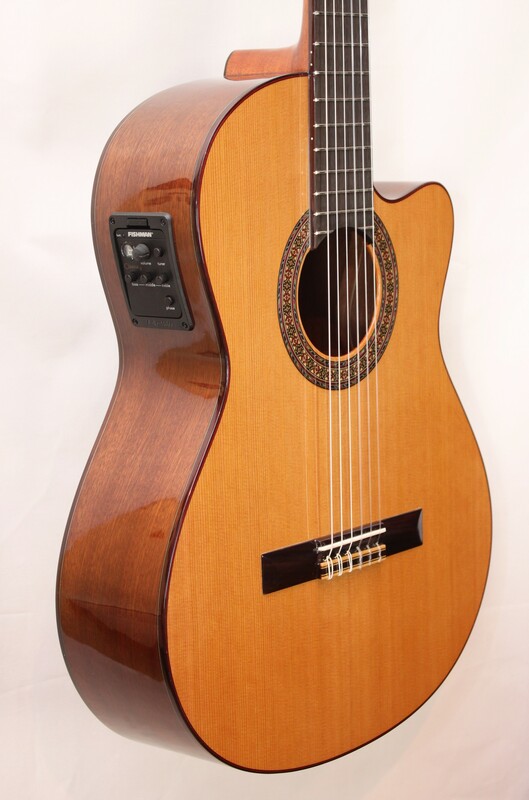 Classical guitars are available in a wide variety of sizes and shapes. There are smaller models that are best suited for children but which adults may find uncomfortable. In the same vein, the wide neck of a full-sized guitar is likely to be too large for a child to handle. The guitar’s shape directly affects its sound and “projection”. A thin body produces a smaller sound with more treble whereas a thicker body allows the bass notes to sound out. What shape you choose to buy is solely a matter of preference. Some classical guitars have longer bodies which may not be attractive to most players; whereas others are wider. The nylon strings of the classical guitar are a big contrast to the steel strings of acoustic/electric guitars. The sound they produce is entirely different and they also feel completely different on your fingertips. An added advantage for beginners is that nylon strings are much more flexible than steel strings, so strumming is easier. Another thing that you should definitely keep in mind is that stringing a classical guitar is done completely different than stringing an acoustic/electric guitar. You will likely learn new methods that most guitarists will not be able to help you with. Projection is a quality that many looking to buy a classical guitar tend to overlook. What is projection? This is the ability of the guitar’s sound to maintain its strength without becoming distorted in quality or clarity. Projection is an important aspect to consider especially if you plan on playing your classical guitar in public settings. You can determine the projection of a guitar by either comparing it to another guitar that you know has good projection or have someone listen to how the guitar sounds when you play it in an open space. Classical guitars have tuning machines that are far different in comparison to those found on acoustic or electric guitars. These are more likely to slip, as is often the case with guitars of a lower quality. The result is an instrument that is out of tune. Test the tuning pegs to make sure that they run cleanly without any slippage. Wind and unwind them to see if here are any jumps or catches in the mechanism. Nothing is more frustrating than a guitar that easily gets out of tune. Following most if not all of these guidelines should help you to find a classical guitar that is just right for you. Happy shopping!